Pika Defy Death by Climate Model! I respond to the recent decision by San Francisco Superior Court Judge Peter Busch ordering the California Fish and Game Commission to reconsider an earlier decision by the Commission to deny state endangered species protection to the American pika (Ochotona princeps). I have been informed by Dale Steele and Scott Osborn that the Commission has directed you to analyze this case. I write to introduce myself and give my professional opinion on various aspects of a potential listing of the American pika. I am a Professor of Conservation Biology and am passionate about teaching in this field (I have won each of the highest teaching awards at Arizona State University). I teach that good policy rides on the back of solid and creditable science. I even have California credentials (thus some standing in this instance. ): I am a 7th generation Californian (a Peralta), received my undergraduate and doctoral degrees at UC Berkeley and UCLA, respectively, and whenever possible reside at our family cabin in June Lake (Mono County). For the past twenty years I have served as Chair of the IUCN Species Survival Commission Lagomorph Specialist Group (I have been a member of the IUCN/SSC LSG since 1978), and in that role I am responsible for compiling the Red List status of the world?s lagomorphs. The IUCN Red List is the gold standard for endangered species listing, as it utilizes a comprehensive suite of quantitative criteria to determine the threat status of species. Approximately a quarter of the world?s 90 lagomorph species are threatened (listed as Vulnerable, Endangered, or Critically Endangered); the American pika has the lowest threat category of “Least Concern (but decreasing).” I am also not shy to engage in campaigns to educate the public of the threatened status of many lagomorph species (some of the rarest mammals on earth are lagomorphs). I took advantage of the recent kickoff for the Chinese Year of the Rabbit to circulate a press release that was carried in one form or another by 1,400 news outlets worldwide that highlighted the plight of red-listed lagomorphs. determinations. Also, since the time that the Commission last considered a petition to list the American pika as endangered in California, the USFWS issued a comprehensive analysis at the species, subspecies and DPS level and determined that it did not meet criteria for species listing under the ESA: http://www.fws.gov/mountain-prairie/species/mammals/americanpika/02052010FRTemp.pdf . Let me examine in some detail each of these claims to determine their scientific veracity. The issue is framed as to whether or not pikas are in danger of extinction, not whether or not they are a climate-sensitive species, and this is an essential distinction. This statement is a half-truth. It has been repeated in nearly all CBD press releases, and now it is even portrayed in a full display in the California Academy of Natural Sciences in San Francisco. It was repeated in testimony by Herbert Frost (Associate Director for Natural Resources Stewardship and Science, National Park Service) before the US Senate Committee on Energy and Natural Resources Field Hearing, Rocky Mountain National Park, Senators McCain and Udall in attendance: “…because of their warm coats, they [pikas] are unable to tolerate temperatures above 78 degrees Fahrenheit for even an hour.” This constant repetition has given this statement increasing credibility. treatment at high elevation (11,000 feet in the nearby Sierra Nevada) where temperatures were cooler. It would be correct to say that pikas die when confined in the sun at relatively low ambient temperatures and are unable to behaviorally thermoregulate by retreating to the cool interstices of the talus, their preferred habitat. My work at Bodie showed conclusively that pikas did just that – behaviorally avoiding mid-day warm temperatures in mid-summer. It is misleading of the CBD to claim to be scientifically astute yet perpetrate in press releases the untruthful image that pikas perish when ambient temperatures reach 78oF. They do not die at these temperatures; they retreat to the cool interstices of the talus. The Moritz et al. 2008 Science paper - the Grinnell resurvey - is terrific. But …they found a single locality (at Glen Aulin) without pikas, and Figure 1 (below; from the Science Supporting Online Material) states the scientific findings of this study concerning pikas. In addition, Jim Patton (UC Berkeley) has testified in a statement presented to the Commission: “We, in the Yosemite study, are a long way from even believing, much less documenting, that the pika is under any threat any place in California. Every population we?ve encountered in Yosemite is seemingly healthy.” “It is not correct that „in California, pika populations have been lost from multiple low-elevation sites in Yosemite National Park.? We failed to find the pika at only one of the historical sites where [the 1911-1920 researchers] had observed and/or collected the species. [This] is but one data point for range retraction, and the cited degree of retraction could result simply from the elevational spacing of the sites. It is impossible to conclude when in the past 90 years that event occurred. It could have just as easily been in 1916 as any year hence. Use of the word „recent? is unjustified.” This statement is known to the CBD (representatives of the CBD have been present at meetings where Patten further clarified this point), yet they have persisted to claim that this paper documents an upslope range shift in the Sierra Nevada for the pika. I have spoken with another co-author of this paper, Steve Beissinger, and he simply cannot understand the lengths that the CBD has gone to misinterpret their results. Figure 1. 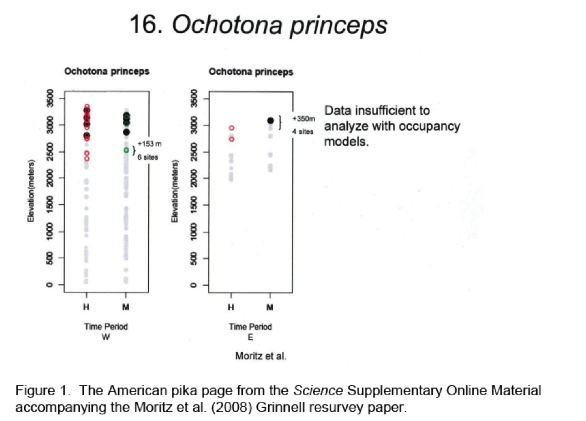 The American pika page from the Science Supplementary Online Material accompanying the Moritz et al. (2008) Grinnell resurvey paper. This statement stems from surveys conducted over the past few summers by Lyle Nichols, one of my former doctoral students, who has thoroughly surveyed all potential pika habitat across the Bodie Hills plateau. The press release statement ignores my long-term work at Bodie State Historic Park (BSHP). None of Nichols? work is published, and neither are my earlier observations from the Bodie Hills area or the recent data we have been collecting at BSHP (a publication is in draft form at the present time). I will summarize and comment on these respective results. Nichols presented data at the recent meeting of the California Pika Consortium documenting that his surveys indicated pikas were missing from all potential native habitat in the Bodie Hills. He is a thorough scientist and his results have credibility, but there are other investigators, such as Connie Millar, who believe that there may be instances of patch occupancy in this region. Thus currently there is a bit of a controversy which will only be solved with further surveys. Even if pikas are found in a few patches in the Bodie Hills, however, I do not doubt that they “have largely disappeared” in this region. In doubt would be when the extirpations occurred. At the time I was initiating my work at BSHP (1970), I broadly surveyed, trapped, camped overnight, etc., on many of the natural rock talus formations in the Bodie Hills. Unfortunately, at the time we did not have GPS units, etc., and my notes only indicate the general locality of the areas that I surveyed (largely on a transect along the Geiger Grade road between Bodie and Masonic). I found old pika sign (scats), but did not find any indication that pikas were extant in the region (no fresh haypiles, no fresh scats, no calls heard although camping on site). This was over 40 years ago, before any major climb in temperature as may have occurred due to recent effects of global warming. Most of these patches were small and isolated, and all small pika populations have a probability of stochastic extinction…, thus it is not surprising that pikas are no longer found on a majority of these sites. Given that they were vacant over 40 years ago, however, does not mean that the populations have disappeared recently (in the past few decades) due to global warming as claimed by the CBD. Some of these natural habitats must have contained pikas as late as the onset of mining at Bodie and nearby Masonic – as the anthropogenic ore dumps that sprang up amid a sea of sagebrush and bitterbrush has been a haven for pikas that colonized from the natural habitats. In the late 1940s a UC graduate student, Joye Harold Severaid, worked on pikas at Bodie, and I initiated my work there in 1969. I conducted my first full census in 1972, determining that the pikas did not inhabit every ore dump at that time, but that there was sufficient pika-specific sign to indicate that at one time each ore dump had been occupied. The spatial dynamics of the survey indicated that pikas are more likely found on large habitat patches and those close to an occupied site – conversely, small and isolated patches were most likely to have lost their pika population. I resurveyed 5 years later and found the same relationship, although there had been dramatic turnover (loss of pikas on previously occupied patches, and recolonization of previously vacant patches). 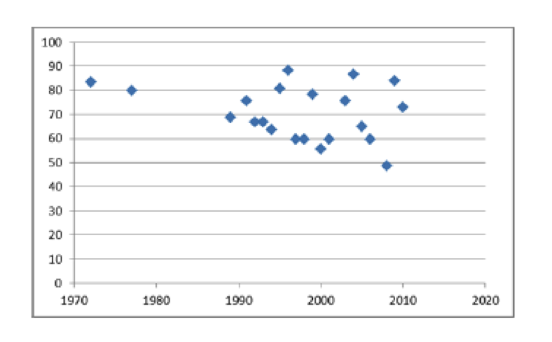 When I returned to resurvey this classic metapopulation in 1989 there were signs that the southern constellation of patches was in decline, and this trend led to near extinction of all patches in the south by 1991. We have censused this metapopulation nearly annually since that time (with many years by Nichols, some years by another former student, John Nagy, and myself, and numerous colleagues); our last census was in September 2010. The south (the Bodie site is configured almost like an “8” and there is a constriction of patches in the middle) has never recovered, but the pika metapopulation in the northern constellation currently remains as healthy as it was in 1972. 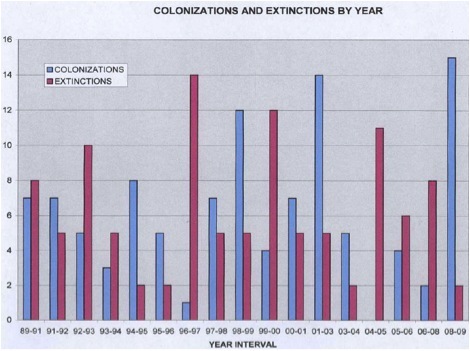 Figure 2 shows the dynamic aspect of extinction of pika populations on patches (115 occurrences) and subsequent recolonizations (110 occurrences) since 1989; Figure 3 shows the percentage of patches occupied over time in the northern constellation of patches (for example, the percent occupied in 2009 was slightly higher than my initial observation in 1972). We do not know why the southern constellation collapsed, although such a metapopulation collapse has been predicted by metapopulation models (some stochastic event – or a very efficient weasel – could cause some key patches to experience extinction events and with fewer patches to produce propagules a critical threshold is reached where the system collapses). At the time we ruled out climate, as it is a mere 3 km from north to south in this system, so it was unlikely (and remains unlikely) that the south could have been affected by climate that did not simultaneously influence pika dynamics in the northern constellation. From the beginning (pattern of isolation of vacant ore dumps) it was apparent that pikas had a difficult time dispersing between patches and colonizing vacant patches – this is what makes Bodie such a classic metapopulation (the mix of occupied and unoccupied patches). But, it is possible that a warming climate has negatively influenced the ability of pikas to disperse to the south from the occupied north (through the bottleneck of a few key patches in the middle). If warming climate truly affected Bodie pikas, the constellation of 37 ore dumps in the north would be on its last legs instead of showing effectively no change in 40 years. At the time of my early studies at Bodie, average high temperatures in mid-summer were 8.3oC warmer than at 11,000 in the nearby High Sierra. The maximum anticipated change in temperature over the next 100 years due to climate change is expected to be 6oC. It is possible to examine current-day pikas at Bodie to determine the flexibility and resilience of pikas to warming temperatures. And, the healthy metapopulation in the northern constellation of ore dumps negates the contention that warming temperatures are causing pikas to disappear in the Bodie Hills. This claim comes from another unpublished study – which was conducted by Scott Loarie (Stanford University). 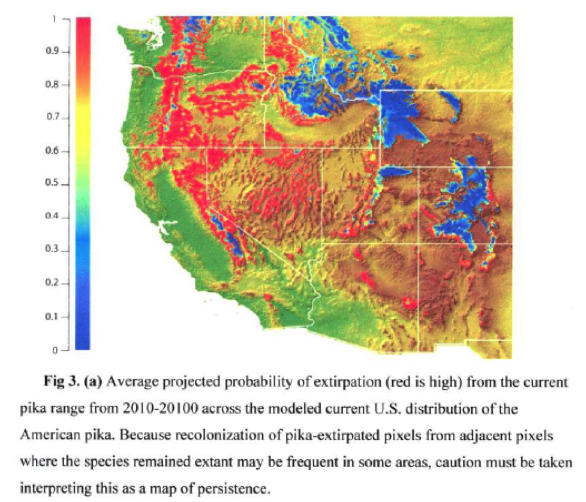 Climate envelope models, which fail to account for the ecology and behavior of animals, are falling into disrepute (see discussion in the USFWS pika listing decision: http://www.fws.gov/mountain-prairie/species/mammals/americanpika/02052010FRTemp.pdf ). However, S. Loarie claims: “we project a substantial probability (>0.5) that climate change from mid-high emissions will extirpate pikas from 71% (67-85%) of our study sites by 2100.” This manuscript has been circulated widely for some time, but it is with some reticence that I comment on it – because it is impossible to know its status or the present contents of the manuscript. However, the quote above comes from the version I have. To calculate a percent decline requires a numerator (in this case Loarie?s extrapolation of occupied pika habitat in 2100, and a denominator, the current range of the American pika. I will comment on the denominator, as this highlights problems with this approach. Figure 4 is from Loarie?s manuscript, and the color red indicates current pika occupancy (or in his own words from the figure legend: “…from the current pika range from 2010-20100 [sic] across the modeled current U.S. distribution of the American pika.” However, for example, no pikas have ever, even in paleontological time, occurred in Arizona - yet Loarie portrays the current distribution of pikas as including Arizona?s White Mountains, San Francisco Peaks, and the Kaibab Plateau. Similarly, the Great Basin bleeds red with pika occupancy, but one can compare Loarie?s portrayal with a map constructed by the CBD. 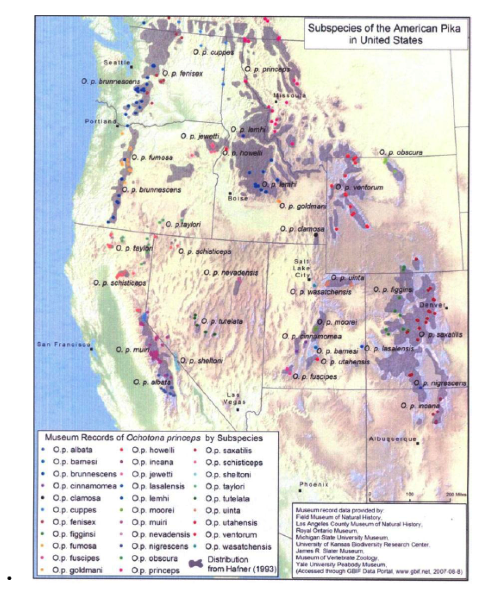 (Figure 5) to see the accepted current distribution of pikas in this region. And in California, the red zone also includes significant areas without pikas (look at the mountains of southern California.). Thus, with a greatly inflated denominator – filled with putative habitat where pikas do not currently occur – Loarie is able to correspondingly inflate his estimate of pika declines over the next century – and this includes California. I grimace at the hyperbole of the current PR campaign to make the pika an endangered species, as I similarly decry the loss of scientific objectivity and/or the failure of those embarking on this campaign to recognize that the USFWS, State of California and IUCN have all objectively not listed the pika as endangered. I teach the next generation of conservation biologists, and it is an affront that I have to instruct them to worry not only about the flank of those who are climate change and endangered species deniers, but now also those who purport to support these issues. I have “endangered pika” lip gloss in my pocket, and I just learned about “endangered pika” coffee beans. Major posters in BART stations, the California Academy of Natural Sciences, and many store fronts on Pearl Street in Boulder, Colorado, all have pikas marching off the tops of mountains. I have no control over this PR campaign, but I write this letter to you in my attempt to ensure that agencies properly charged with making endangered species determinations get it right. I agree totally with the CBD that this is an issue that should be based on the best available science; in this case the best available science dictates that the pika not be classified as Endangered in California.